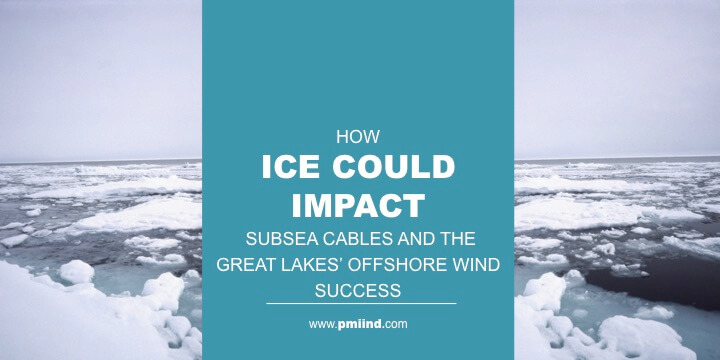 Ice hasn’t necessarily put a chill on the development of offshore wind in the Great Lakes of North America, but it does pose a significant challenge — both in the design of offshore wind turbines and the maintenance of subsea power transmission cables. Winter is a wildcard for the Great Lakes because the offshore wind industry has traditionally avoided ice-prone regions. Most new oceanic wind farms can tap decades of knowledge gleaned from the maturation of Northern Europe’s offshore wind industry. That’s not exactly the case for projects in water that freezes every year. The first wind farm designed specifically to cope with ice opened off the west coast of Finland in the autumn of 2017. The 42-megawatt Tahkoluoto wind farm relies on gravity-based foundations that are tapered at water level to resist friction with ice. The extreme weight and mass of ice place relentless pressure on anything in its way. Wind farms on the Great Lakes have to be designed with these risks in mind, laying cables strategically to keep them away from ice flows and buildups. The inherently unpredictable nature of weather and the motion of ice could conceivably surprise wind farm developers. Winter repairs will be extremely complicated. It’s difficult enough to send a ship to the site of a cable break in the open sea — it can take weeks or months to get a crew to the site, fetch the cable, repair it, and return it to the seabed. Imagine attempting repairs in the winter in the Great Lakes where variable weather changes the ice thickness constantly. Engineers can design for the most likely scenarios for subsea cables, but there’s nothing like real life to teach us lessons we couldn’t foresee with ice and wind farms. The abundance of strong winds across the Great Lakes creates opportunities to develop new technologies and engineer novel solutions to icy problems. As ice resides along Arctic coastlines, wind farm developments could bring clean power to remote communities that otherwise depend on fossil fuels for heating and light. However, we can only figure out so much of what is on the drawing board. To understand the depth of the challenges of ice in offshore wind, people need to build wind farms and learn the lessons nature inevitably provides. At PMI, we look forward to engineering rugged, high-performance subsea cable accessories that will be critical to the success of wind power in the Great Lakes and beyond. Market Opportunities for Offshore Wind: What Does the Future Hold?